I would love to share with you the story Neil Young told Thursday night about his Martin D-28, which once belonged to Hank Williams and shared the Morton H. Meyerson Symphony Center stage with him on what was for the most part a very special night. But I can’t, because Young wasn’t allowed the opportunity to share the tale. He tried. He held “Hank” in his hands and began recalling that trip to Nashville, when, from the balcony, to Young’s left, a man began shouting: “Play it! 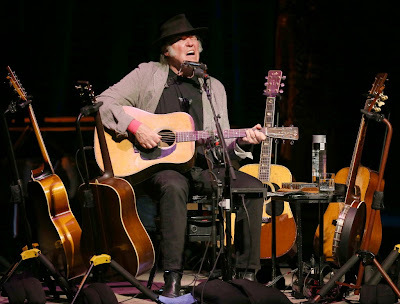 Play it!” At which point the 68-year-old who’s been making music since high school reminded the crowd that no one tells Neil Young what to do. “I don’t think I’m gonna play it,” he said. Beneath his black wide-brimmed hat, he grinned a little. But you could tell: He was not pleased. The heckling continued, because this is just what some people do: spend hundreds of dollars to see their heroes, only to steal their spotlight. “What, do I work?” Young said, the good humor now completely gone from his voice. “Is this a job? I’m trying to recall the last time I did something expressly because someone told me to do it.” The rest of the crowd cheered, almost as though it were trying to distract Young or jolt him back into the jovial mood he’d been in moments earlier, following a version of “Mr. Soul” played on a pump organ. Instead he just played the next song: “Harvest Moon,” one of the more beautiful entries in a canon filled with tenderhearted melodies. But Young strummed the guitar a little harder than usual, and didn’t so much sing its simple, sentimental lyrics (“When we were lovers/I loved you with all my heart”) as he did spit them out. Neil Young performs solo concert at Meyerson Symphony Center, Dallas, Texas, tonight, Thursday, April 17 & Friday, 18, 2014.
there are tickets available for $100 in the dress circle right now!! Hi Folks, Just found your site. Would you mind if I make a request. 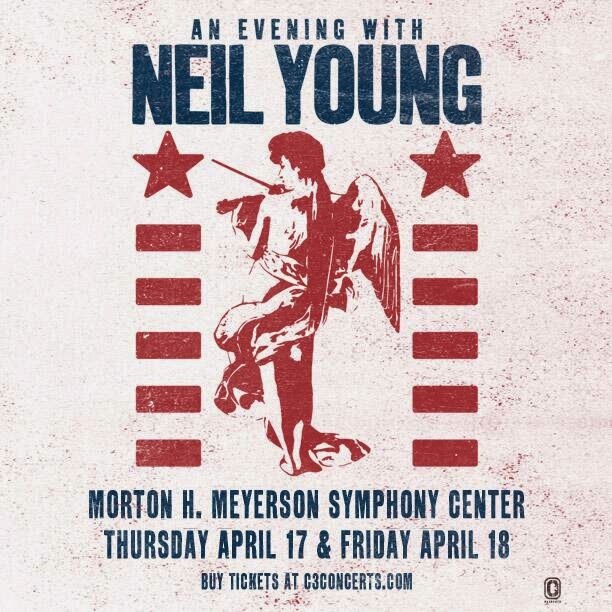 I am looking for the bootleg Neil Young & The Bluenotes – Ain't Singing’ For Pepsi. Would anyone out there know of a link to this. Thank you all if you can help. Happy Easter to everyone. my guess is it's gonna take you a little while to figure out torrents and flacs but trust me you'll get it. or you can go the youtube route and purchase some audio streaming recording software. Anybody else noticing more Neil/audience interaction on this acoustic mini-tour? Even of the negative variety. I'm astonished that some folks feel they have the the right to interrupt the artist while he's painting. To paraphrase the man hisself, "After nearly 50 years of doing this, don't they think he knows what he's doing?" I think that the best source for Bluenotes recordings is Wolfgang's Vault. These streamings and downloads come from the officials recordings for the planned live album. @Tweedboy - chill. reviews trckling in now. DID ANYONE GO TO THE SHOW??? HOW BOUT SOME DETAILS!!! They should put muzzles on some of the participants or scream out and you are gone. Those rude people ruins it for the civilized people. Thanks for the setlist, Anon 12:35! Can you provide some more info about Red River Valley? Since you've numbered that song and After The Gold Rush as #19, was RRV just a short harmonica piece before Gold Rush, or did he play it in full with lyrics? Did he play Harvest? I was there and feel he played Promise of a Man in that slot. However I was respectful and did not turn on my phone so I could use the light to write down the setlist. I was so embarrassed to be representing Dallas in that incredibly rude audience in such an intimate setting. Neil played Red River Valley while walking from his seat/guitars over to the piano and continued playing while he was standing at the piano reviewing what I assume was the set list. He sat down and played After the Gold Rush. I don't think he played "Heart of Gold" either. I have "I've Been to Hollywood" in that slot. One of the lines in Heart of Gold is "Ive been to Hollywood, Ive been to Redwood" So yes, we are talking about the same song which only confirms he closed with Heart of Gold. BTW: Mr Soul on Neil's pump organ and harmonica in the sonic realm of the symphony center was phenomenal. A totally different song. Sounds like some of the Idiot Brigade was in attendance last night. These half-wits are unbelievable. They should hire paint-gun snipers to shoot these fools in the mouth when they don't shut up. NY has done 9 of these shows with say 3000 people each show. That's 27,000 folks of whom maybe 40 behaved badly. engages these jerks with a hissy fit and punishes the masses with shorter sets and grumpier demeanor. Madness is doing the same thing over and over again and expecting different results. I posted my impression from yesterday's show on my Facebook page. But I will post it here. Neil Young covered this song last night. One of the highlights of the evening. Neil's cover of the song. He had the same kind of argument with some fan yesterday. He hates people rushing him. Bastards killed his mood for the song in this link. Highly recommend this show for everyone to see. It is very intimate. It is touching. It shows his tenderness and in the same time you can see what an uncontrollable, expanding temperament he has boiling under this fragile appearance. My friend saw him before and described him to me as a soft spoken, mild mannered gentleman, well... it is not my experience...His voice was strong and clear. He doesn't allow any suggestions to his show and would prefer his listeners to pay attention and not to scream. Well, that's my kind of show. I like attentive and intelligent audience. He looked very elegant, had small hands and small feet, he walked slowly, with care, but there was some lightness in his gait. God knows how he does it, but he reached better results than Peter Gabriel who commands a public really great as well, and who was a champion of grabbing public's attention and holding it... until I went to this show. It just feels that you better not try to go against him, you will regret. he was talking about one of his guitars (he had 6 acoustic guitars on stage and one banjo) and someone from audience cried, "Now Play on it" or something to this effect. Jokingly, I think. Neil took the joke and said with a sardonic humor and a firm authority that he doesn't remember, when it was the last time when he did something that he was asked to do. He said, "Is it a work, is it a job here?" Then he played Harvest Moon with a big feeling. But in the end said that this song was not supposed to be angry, but it was in this setting. And he added, "You get what you demand". Minute later he wetted his harp or its mouthpiece in a glass of water for something and shook it in the air in the direction of the guy who was demanding him to play and not to talk. Made me chuckle. he was very likable and it was a evening of reminiscences and stories in music form and in conversation. His motto is definitely Quality... in everything he does: from his songs, and acoustics of chosen venues to T-shirts and posters I saw in the hall and didn't buy. Because for the quality he asked quantity of money. He commented about great sound of our Morton H. Meyerson Symphony Center a few times, admiring it and said he wants to work here eventually. It was announced before the show not to scream titles of songs or requests to a singer. Well, some people still did. Show is well thought out, decided on the form and not a subject to change by requests from audience. Fidelio, it was a joke. Of course he played Heart of Gold. And he played Harvest, too. One of the lyrics of Harvest is "with the promise of a man". What do you suggest he do instead? Ignore the idiots? I enjoy when he lays into them, and it sounds like the majority of the audience does as well. It won't end it completely, but maybe some people will think twice about shouting like a fool. Irony not lost on me. I look forward to hearing about tonights show. Thought that news on new album would have gotten more comments but I'm obviously mistaken. But I'm looking toward to it anyway. Anyone seen the new album in Europe? Gonna have to fire up the turntables for this one. Here is a look at the Voice O Graph that Neil had to squeeze into at Jacks shop. Wonder how many quarters he needed. Would have loved being a customer that day. Any word on the Friday Meyerson show? I see he played Cortez the Killer. Guess the audience was more respectful. Just a thank you for those who have replied. The one I'm after seems very elusive. Happy holidays to you all. And I wish we saw Neil more over this side of the pond. Thanks everyone for all of the reports. We'll have more on Letter Home soon! I detest these morons who yell and whoop during quieter moments of songs and otherwise shout out song requests in between songs. It's precisely this kind of cretinous behaviour that puts me off going to see Neil in these kinds of intimate solo settings. This wasn't always the case. During the 1970s, for example, people used to actually act respectfully by listening to Neil. It must be really off-putting for an artist when these morons shout out stuff. Go back and listen to Carnegie 1970-12-05 or Boston 1971-01-21, there were morons then, too.